Love it. It takes an original puzzle concept and makes a great gameplay out of it. Enjoyed the whole game, it is short and sweet and a concept unlike any other game I have played. A short but very sweet game that has some phenomenally realized mechanics and a story that is unmatched, at least as far as Valve games go. 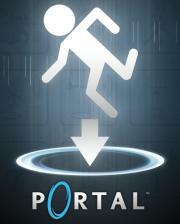 Portal is the perfect puzzle game for one single reason. It's actually challenging. Each level makes great use of the physics and mechanics built into the game. A new concept back in the day and a great one, too! The humor is a little too zany sometimes, but that's the worst thing I can say about this game.